DWR's conservation outreach section chief tells about several ways your old Christmas tree can provide shelter for wild animals. YOU’VE ENJOYED IT throughout the Christmas season and well into the new year. Fresh pine aroma engulfed the house, and solid branches carried the burden of bright lights and treasured ornaments. Now, despite weeks of watering, you’re starting to find needles on the floor. It’s probably time to put the tree out on the curb for the city to haul to the landfill — or maybe grind into mulch for flower gardens at the local park. But wait, before you get rid of that tree, doesn’t it still have some value? Sure it does! That ol’ tree can benefit wildlife well into next summer or even for a couple of years, depending on what you do with it. Coniferous trees — also called conifers — produce cones, are generally evergreen and have needle-shaped leaves. Examples of conifers include pines, spruces and firs, many of which are harvested for use at Christmas. Songbirds and quail roost in coniferous trees at night, taking advantage of warm air trapped in the dense branches. Blue grouse spend the winter eating needles from certain fir trees. Deer, elk, snowshoe hares and other wildlife use conifers to conceal themselves from predators and avoid harsh weather. However you choose to decorate it, your “bird Christmas tree” will provide countless hours of bird-watching fun through the rest of the winter. 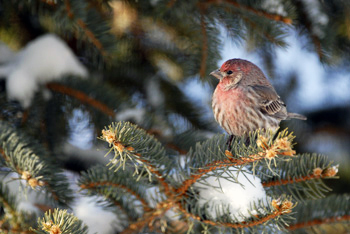 House finches are among the birds that could be attracted to your old tree. If you live in a neighborhood where there aren’t many trees, you can use your old Christmas tree to provide cover for birds. Simply drive the base of your tree into a snowbank and leave it for the birds to use. If you have a clothesline, you can collect discarded trees from your neighbors and lean all of them against the line. This creates a “lean-to” that can shelter many birds during nasty weather. Or, if you have existing trees, merely string some ropes between them and lean the Christmas trees against the ropes. 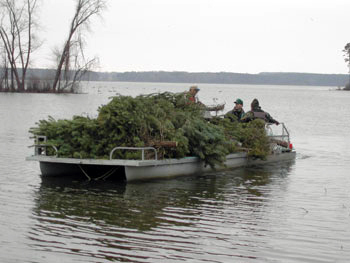 Submerged Christmas trees make excellent habitat for fish and other aquatic wildlife. If you have a pond or stream on your property, you might want to collect a few more Christmas trees, tie them together and anchor them in the pond or stream with large rocks. This will offer local fish, amphibians and aquatic insects a place to live. You can also use Christmas trees to keep a stream, creek or river from cutting into its banks. The trees create a diversion, reducing the force of the water. Pools form behind the trees and provide an ideal resting place for fish. You can turn discarded Christmas trees into a brush pile that offers ideal wildlife habitat. These piles provide escape cover, nesting sites and dens for ground squirrels, cottontail rabbits, weasels, skunks, snakes and red foxes. Brush piles make ideal habitat for wildlife. You can build a brush pile on a larger backyard lot or scatter multiple piles throughout nearby woodlands, meadows or farm areas. Because they attract skunks and snakes, you might not want these piles too close to home! Brush piles need to be at least five feet tall and 12 to 15 feet in diameter to be useful to most wildlife. You can create them by stacking Christmas trees in a grid pattern on top of each other. If you want to build a big brush pile, you should start with a foundation of large rocks, stumps or logs. This sturdy base will keep your brush pile from decomposing too quickly. You can also place several heavy logs on top of the brush pile to keep it from blowing away. Old sections of culvert, drain tiles or hollow logs placed in the foundation provide ideal den sites. You can keep your brush pile thriving by adding tree branches that you trim during yard clean-ups later in the year. And if you don’t like the somewhat untidy look of your brush pile, simply plant a hedge of roses or raspberries around it! By thinking ahead, you can extend your enjoyment of that expensive Christmas tree. Use your imagination to create structures and objects beneficial to wildlife. And then keep an eye on the tree — you’ll be amazed at the wildlife in your own backyard! << (Previous) Deer: to feed, or not to feed.